The Sandra Bullock heist caper led at the box office on a weekend when the three top movies were all led by women. 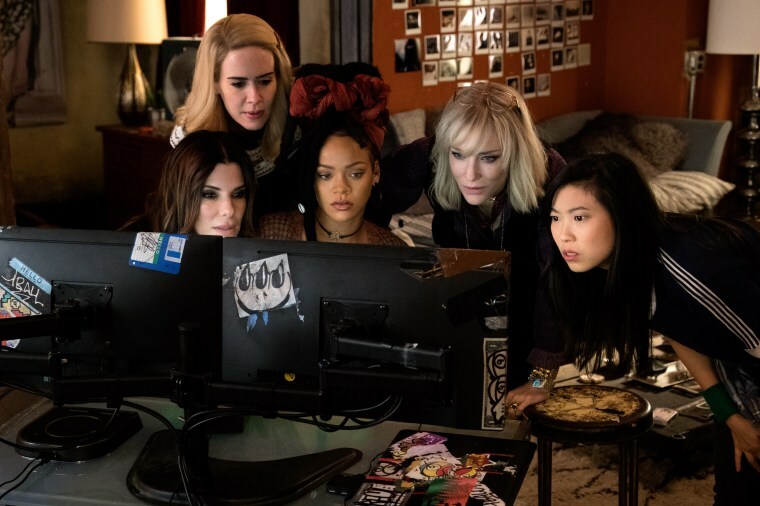 NEW YORK — "Ocean's 8," the woman-fronted overhaul of the starry heist franchise, opened with an estimated $41.5 million at the box office, taking the weekend's top spot from the fast-falling "Solo: A Star Wars Story." At a lower price point and in a less fanboy-guarded franchise, "Ocean's 8" — despite ho-hum reviews — found nothing like the stormy reception that the female-led "Ghostbusters" reboot did on the same weekend two years ago. Made for about $70 million, "Ocean's 8" and its cast, featuring Sandra Bullock, Cate Blanchett and Anne Hathaway, set an opening-weekend best for the franchise, not accounting for inflation. The three previous "Ocean's" films — starring Brad Pitt, George Clooney and Matt Damon and based on the 1960 original "Ocean's 11," with Frank Sinatra — all debuted with $36 million to $39 million in the last decade. "We thought we'd come in in the 35 to 40 [million] range," said Jeff Goldstein, chief of distribution for Warner Bros. "Number one, it's fun. Number two, it hits an underserved audience. Unfortunately, there is just a lack of stories that are aimed right at women." Yet the weekend's three new wide releases were all fronted by women. The horror thriller "Hereditary," starring Toni Collette, debuted with $13 million, setting a company record for A24, the indie distributor behind releases like "The Witch" and "Moonlight." The feature directing debut of Ari Aster, "Hereditary" has received rave reviews and been hailed as the year's scariest movie since its debut at the Sundance Film Festival. Either from disappointment or simply because they were stunned from fear, audiences gave "Hereditary" — about a family cursed after the death of its matriarch — a D-plus CinemaScore. Coming between more massive blockbusters like the recent "Solo" and the coming "Incredibles 2" and "Jurassic World: Fallen Kingdom," the weekend was down by about 20 percent from last year, according to comScore, when "Wonder Woman" was setting box office records. But some of the story was still the same. Think: New 'Ocean's 8' sends Hollywood a feminist message. But not for the reasons you think. "There's a lot of women-powered revenue at the box office in the heat of the summer season," said Paul Dergarabedian, a senior media analyst for comScore. "Films featuring female leads are killing it at the box office, but that's been going on for quite a while." Opening over the weekend was another documentary that may prove a similar sensation: the Fred Rogers documentary "Won't You Be My Neighbor." The Focus Features release grossed $470,000 in 29 theaters, for a per-theater average of about $16,000. The film, rated 99 percent fresh on Rotten Tomatoes, has been acclaimed for its portrait of the man behind "Mister Rogers' Neighborhood." Focus said two-thirds of the documentary's audience was under age 45. Meanwhile, the troubled "Solo" slid to second place, with $15.2 million, on its third weekend. It has now grossed $176.1 million, well off its expected pace.